Mahdezewin | Downtown Sault Ste. Marie, Michigan! Mahdezewin is an Ojibwa word meaning “living garden of life” Everything you see in this garden will take care of you. It is your loves and hates. It is your food, water and air, your family and friends, your work, your play. All of these things are the garden of your life. They feed your heart, body and soul. You must take care of your garden and it will take care of you.Mahdezewin International was started in 2005 by Richard Lewis for the purpose of preserving, sharing, and teaching Woodland Culture through art and educational resources. Mahdzewin International is a garden all its’ own. It is like a rock with many facets and each facet is different, yet enhances and adds to our garden. Mahdezewin has a speaker, storyteller and teacher. There is a visual orator, a painter of visions, teachings and pictures. There is a historian, who speaks of the past, our roots, travels and evolution. The historian is also the recorder of today for the future generations. A mother and elder, and our newest member, brings wisdom and resources to our family. 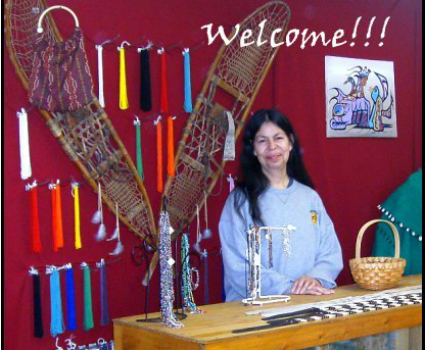 Then there is the mother, the caretaker, keeper of the door, our beader and moccasin maker. She is also a teacher. We also have the youth who is full of ideas and energy. So you see, Mahdezewin is a garden in itself, we are different but the same. Our many facets contribute to and compliment the whole. We are Mahdezewin.